As I’ve written before, I do love drawing spaceships. 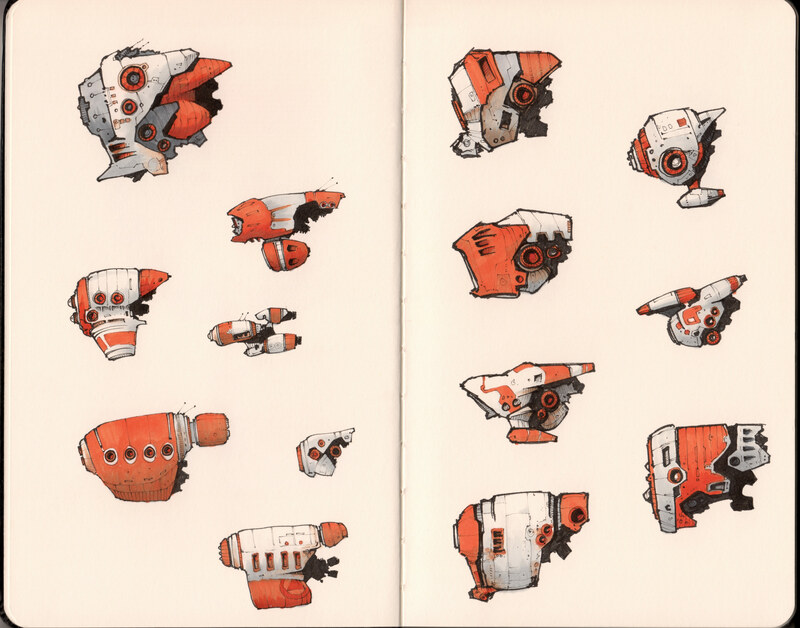 Here’s a whole double page spread from my Moleskine, full of little orange spaceships. Drawn with Staedtler Pigment Liners and coloured with Copic Ciao Markers. Awesome stuff! It would be great to see an animated series where the characters are the ships, taking care of their cargo, be it goods or people. Good if it could retain the character and hand of your drawings, while still adding a 3D feel to it. How do the ciao markers differ from the sketch ones? I just bought a sketch set. Also, love your wonderful work. Hi, thanks – really glad you like the work! I can’t help regarding the markers, I have only used the Ciao Markers, not the Sketch. those are amazing.. the amount of detail you’ve put in is surprisingly good. love your work. followed instantly.